I make a pot of French press coffee ceremoniously each morning. It's a ritual that I look forward to every day. I love the smell of the coffee aroma as I pour water into the fresh ground coffee. When the water hits the coffee it literally explodes into a foamy cream that reminds me of the crema that sits on top of freshly made espresso. I savor the coffee aroma as I pour the coffee into my stainless steel travel mug. If you are longing for a great cup of coffee that is easy and will taste conistent every time that you make it, then you should consider using a French press coffee maker. 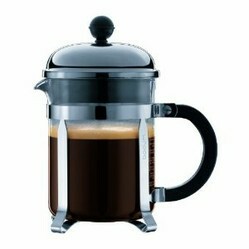 French press coffee is for the purists who like the taste of coffee as a stand alone drink. The first time that I tried using a French press the result was nothing short of disastrous. The coffee tasted like somebody threw some gravel into my coffee cup. I didn't realize that using a quality French press coffee maker and the correct grind of coffee are keys to a great cup of coffee. The reason why French press coffee tastes so good is because nothing interferes with the brewed coffee during the brewing process. 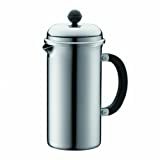 A high quality French press is made with glass and metal and adds no undesirable plastic taste to the coffee. Paper filters tend to impart some of their taste into the brewed coffee. Additionally, a filter will take away some of the good flavors of the coffee. If you use any form of plastic for coffee brewing, you will introduce some of the taste into your coffee. French press coffee has a heavier full-bodied taste because it leaves behind more coffee particulates. The final product is pure extracted coffee. You can serve French press coffee with cream, foamed milk, or black. A good cup of coffee should taste good without adding anything to mask the flavor. Adding either cream, sugar,or both enhances the flavor. Bodum Chambord Hotel 8 Cup Stainless Steel French Press Coffeemaker, 1.0 l, 34-Ounce. Since coffee is 99% water, I use only filtered, spring, or fresh well water for my coffee. I don't want to taste chlorine or anything else that does not belong in my coffee. Start with cold water until it reaches a boil. Let the water cool for a half minute and pour over the ground coffee. Stir and let sit for approximately 4 minutes. As long as your are using a good metal burr grinder, you can grind the coffee semi-course where it will feel like beach sand when you touch it with your fingers. If it is ground too fine, then you will have excess sediment in your coffee. On the other hand, coffee that is ground too course will taste weak as the flavor cannot be properly extracted. You need a burr grinder. The cheap two bladed metal grinders tend to heat up the coffee as it grinds and you will loose significant flavor because coffee oils are volatile. These whirly-bird type grinders are not capable of grinding the coffee evenly. They work marginally well at best. The key here is to not have under extracted coffee. You can always add more water when you are finished brewing. Weak coffee does not taste good. My wife used to complain that some people brew their coffee to taste like tea. No offense to you tea drinkers. She just prefers the strong coffee taste. Some professionals say that you should not brew the coffee any longer than 3 minutes while others say 4 no longer than 4 minutes. I prefer 4 minutes for proper flavor extraction. Enjoy your masterpiece immediately as coffee flavors are reduced over time. The key to choosing the best French press coffee making is in the screen. The screen needs to be fine enough to trap grounds from traveling through and entering your coffee. Additionally, it needs to be wide enough to allow the coffee flavors to be extracted into the water. Bodum seem to have captured the market on great French press coffee makers and this is no accident. I have used many different brands of these coffee makers and I always seem to come back to Bodum. One reason why I have tried so many different brands of French presses is because I am always breaking them. I have no idea why they have to be constructed of such thin glass. I recently broke the glass carafe while trying to clean the coffee grounds with a metal spoon. Bodum has solved this problem by making a French press out of stainless steel. Even though you will initially pay more for a stainless steel French press maker, you will end up saving money in the long run because the stainless steel versions are nearly indestructible. I cannot even count the number of homes that I've been in where I see orphaned French press plungers. I often wonder why these people even bother to saving the plunger knowing that they will get a plunger with their next coffee maker. I have seen replacement French press carafes for sale and they usually cost the same amounts as a complete unit. A burr coffee grinder uses 2 interlocking grinding wheels that grind the coffee as the beans pass through the teeth. This allows the coffee to not over heat as it is ground. Burr grinders are adjustable to the type of grind that you need. I searched online and I kept on reading about the Solis Maestro burr coffee grinder. It's a heavy duty burr coffee grinder that will give you consistent grounds for every brewing method. Years ago I used a 2 bladed metal grinder that did nothing more than give me rocks and powdered coffee grounds. If you don't have a burr coffee grinder then you need to get one. Admittedly, they are not cheap. However, there are some inexpensive alternatives like the German Zassenhause if you don't mind grinding your coffee manually. I purchased a Zassenhaus on eBay for about $50 and it's been very useful. I travel with it and it does not require electricity. If you are not using quality coffee beans, then either start buying them or you may as well stop reading this article and keep brewing your coffee in your usual way. French press coffee brings out both the best and worst in a cup of coffee. I start with high quality aribica coffee beans that I roast myself. You do not have to roast your own coffee beans to make a great cup of coffee. In my not so humble opinion, coffee like Starbucks does not make the list of high quality coffee. Find a local or online micro-coffee roaster and I can almost guarantee you that you'll never go back to commercial grade coffee. This is paramount to making a great cup of coffee. I learned about the virtues of light roasted coffee from Blue Bottle Coffee in Oakland, CA. When coffee is roasted beyond the first crack and into the second crack the natural sugar in the coffee beans becomes burned. Lighter roasted coffee should taste slightly sweet to the palette. I personally use home roasted coffee as I like complete control over the quality of the beans that I purchase and roast.